Importance. -- Many of the large oaks in the East have been attacked by this borer, resulting in defects and serious degrade in the timber. Valuable shade trees in parks and cities are sometimes injured. Identifying the Insect (figure 21a). 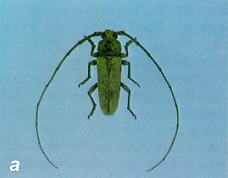 -- Adult borers are about 1 inch (25mm) long, light brown, robust beetles with long antennae. The shiny white, robust larvae have tiny legs on the thorax. Identifying the Injury. -- Initially, tiny pin-holes with fine, extruded frass are present. Later, entrance holes become larger and sap-stained, followed by ejection of granular frass (figure 21b). A few excelsior-like fibers are present in frass just before pupation. Tunnels are about .5 inch (12 mm) in diameter and 6 to 10 inches ( 15 to 25 cm) long (figure 21c). Biology. -- The pest has a 2-year life cycle. Eggs are laid in July and August on the bark. The larva mines under the bark during the first year, tunneling into the wood the second year. Pupation occurs within the gallery and the adult exits through the bark near the entrance. Control. -- Maintain high tree vigor. Remove brood trees. "Worm-out" with knife or wire. 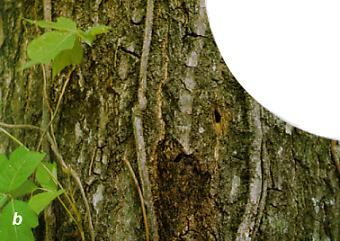 Control in high-value trees with trunk spray or gallery fumigation. Figure 21. 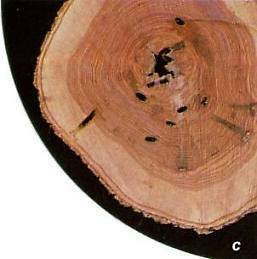 -- (a) Adult beetle of red oak borer; (b) sapstained bark and entrances typical of the red oak borer; (c) cross-section of oak trunk with red oak borer holes.